SWIFT disconnect: Why does it absolutely terrify the corrupt Russian elite? One bank official from Cyprus* explained to me why top Russian officials, such as Medvedev, Kostin, etc., responded so nervously and irrationally to reports of a possible disconnection of Russia from SWIFT. Russia’s economy without SWIFT will continue to operate, albeit with difficulty. But they–personally–without SWIFT will not be able to control their personal anonymous assets in Western banks and will lose access to them. At present, they control their accounts in Western banks anonymously through a chain of front firms, which are impossible to trace. But their operations are completely dependent on SWIFT for operation. All of current money-laundering and anonymization schemes are dependent on SWIFT. Other such operations simply do not exist at present, and new ones can not be developed in a month. Nor in six months, either. And it is not clear that they would be possible at all. When disconnected from SWIFT, the [corrupt elite] will either have to give up control over their anonymous assets or assume a high risk of losing their anonymity. * Cyprus is a major offshore tax heaven for Russian cash. For more information, read Quartz’s What Russian money sloshing back to Cyprus teaches us about tax havens. 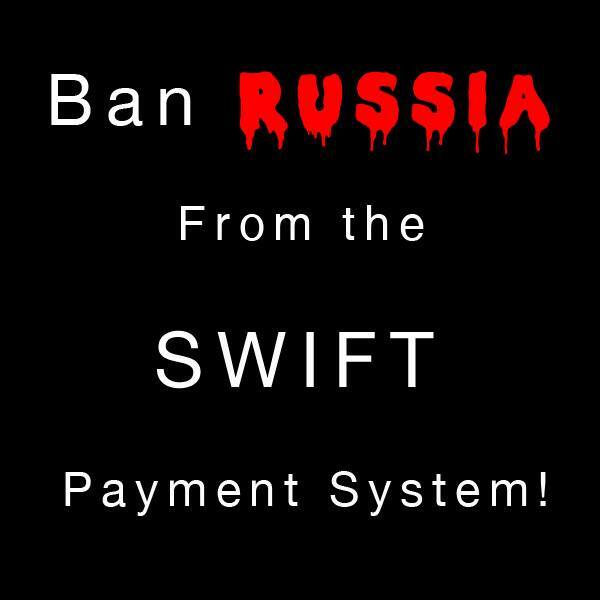 Ban RUSSIA from the SWIFT payment system!